This recipe of Farro and Peas adopts the flavor of the classic Venetian dish Risi e Bisi ( rice and peas) but swaps the rice for farro, adding more nutrition, nutty flavor, and a great chewy texture to the final dish. Fresh spring peas are typically used for the Italian dish but for our farro and peas I used frozen peas. In the past this dish was only prepared on feast days decreed by the Doge (Venice’s ruler). In the days of the Republic of Venice, Risi e Bisi was the first dish served at the dinner given by the Doges each April 25 in honor of San Marco, the patron saint of Venice. Italians ,being Italian and knowing great food, decided that such a great tasting dish shouldn’t just be saved for a special occasion. So today, Italians make Risi e Bisi whenever the mood strikes them. No one else in Italy cooks rice in so many ways as the Venetians and northern Italians. I remember when my cousin Attilio from Trieste, Italy came to visit , I told him how much I loved risotto. Italians have countless dishes combining rice with every vegetable imaginable along with all types of meat, fish or poultry. So when they speak of risotto they include “con” plus the other main ingredients. Now to be truthful, I hadn’t intended to make the Farro and Peas – I had meant to make the actual Italian Risi e Bisi. . .unfortunately I had to go to plan “B” since I didn’t have the main ingredient, risotto rice. I didn’t find this out until we had returned from the beach and we were too tired to run to the store. It had been a long day. Honey had spent the entire day fishing without getting one single bite. I was sitting in my beach chair planning the evening’s menu, reading up on Lightroom and working with my camera. Out of the corner of my eye I spotted an egret slowly approaching my bag. Those beady little eyes were keeping close tabs on me. I’m sure he thought I was harmless enough since I was fooling around with a little black box that had dials, buttons and a big eye. Anyway, with that little black box I was able to get a quick shot of him. I really hadn’t needed to be quick about it. The bird was not easily scared off. . . he stuck around for the whole day hoping he could get some kind of freebie. We certainly weren’t disappointed in our Plan B. The Farro and peas recipe had the texture of a risotto without the work. It came together fairly quickly and then it just simmered on its own. It’s a good thing because after being gone all day we were hungry and were looking forward to a relaxing meal. 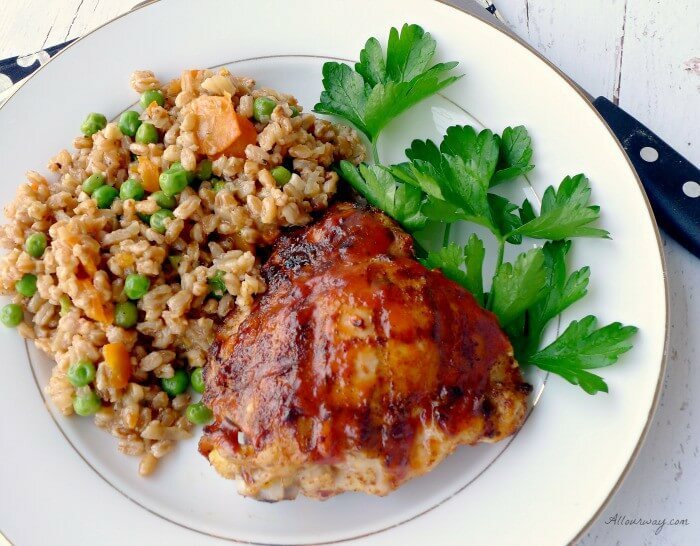 We served the Farro and Peas with our Spicy Bourbon Barbecued Grilled Chicken. We warmed up some of the leftover Farro and Peas the next day and the dish was still delicious. This dish adopts the classic Venetian flavor of Risi e Bisi. 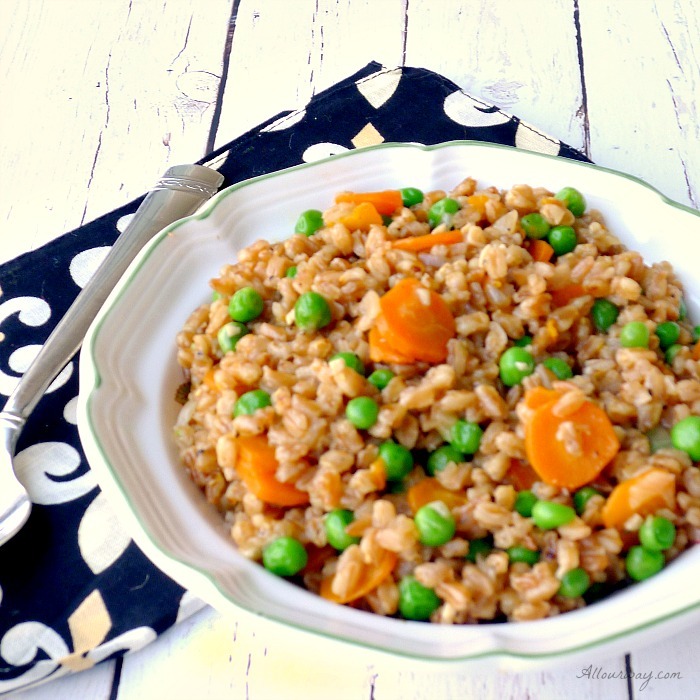 Rice is swapped for farro, adding more nutrition, nutty flavor, and a fantastic chewy texture to the final dish. Heat oil in a saucepan over medium-high. Stir in farro, onion, carrot, and garlic; cook until onion softens, 3-4 minutes. Deglaze pan with wine and reduce until it nearly evaporates. Stir in broth, bring to a boil, then reduce heat to medium-low. Cook farro until tender and broth is absorbed, 20-30 minutes. Stir in peas and Parmesan; season with salt and pepper. Serve with additional Parmesan to sprinkle on top. I’ve not tried farro before, but this looks like quite the happy accident after a long day of fishing! Definitely putting farro on list to try out. This looks perfectly delicious! What an interesting side dish. I am a new fan of faro and have been looking for more recipes to use it. I prefer the nubby texture of the faro than rice. I hadn’t thought about using it in risotto recipes. Brilliant. I’m going to start with this recipe though…the peas and carrots are sure to be a big hit in this house. Ohh, I love farro! I usually serve it over a salad of some sort. But I’m loving the idea of curling up with a big bowl of it. It’s so nutritious and warming. Not to mention perfect for weeknights—so quick and simple! I am so excited for this recipe! I have an almost full bag of farro that I purchased on a whim and never got around to using it. I love anything with peas so I’m totally down to try this recipe in the new year. It was so interesting to learn the history behind the original dish. I love all Italian food because of its emphasis on highlighting fresh, seasonal ingredients, and this dish is no exception. I’d love to try it in the spring with fresh peas! Now that’s a good Plan B! 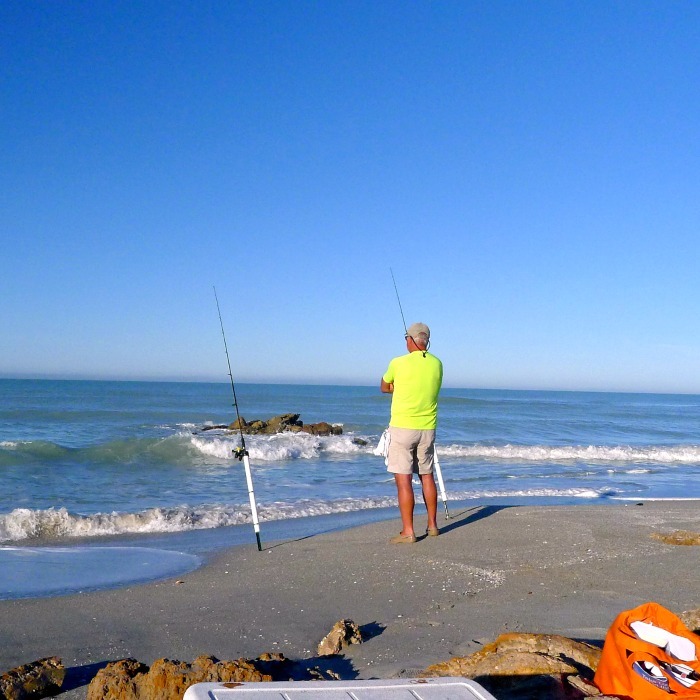 And what a great setting to think it up – ahhh the beach, with entertainment, too! Ha! You know the first time I had farro was in Riparbella but I haven’t had it much since – time to fix that! Pinning this recipe for later. Risotto con… what? Love that! Risotto with anything and everything… that’s what. I’m with you. I’d have to make a special trip to the store for arborio rice, but I think the farro swap makes a great stand-in for the rice. And I love your click of the bird — just nosing through your bag. Is that an egret? heron? I have not cooked with farro that often, but I like it a lot. This recipe is the perfect side dish to so many proteins. I could just grill up some shrimp as a topper and call it dinner. In fact, that sounds like a great idea for dinner tonight….it is mild outside. Hubby can fire up the grill. I anxious to see what your creative mind comes up with for the farro 🙂 Honey is VERY disappointed we won’t be taking any fishing packages home this time — only three more weeks to go. Hi Marisa, so nice that I found your blog. I am italian, from Rome, and I love risi e bisi. Some of my relatives live in Vicenza and that’s where I learned to make it. I use arborio rice, or vialone nano for the risi e bisi and no carrots. I like your version with farro and the carrots add a touch of color. In Italy you’ll never see a piece of meat close to a risotto, though 😉 . You have your first course, usually change plate, and then on with the “secondo e contorno” (pretty strict, these italians, eh? 🙂 ). Ciao Nicoletta! I’m happy you found me too!! 🙂 Now if I were married to an Italian I would love to serve our meal in “courses” but I’m married to a German/Scot who loves ALL of his food on his plate. I like the idea of slowly savoring each dish. So many times I see people eating their food in a clockwise or counter-clockwise fashion — that is if they have a system. Abbracci! Thank you Revathi! Fargo is easier than risotto and oh so good. You could add any type of veggie you like. Thank you it is easy to make and it is delicious. I hope you try it! Love this dish! Simple, beautiful and tasty! Can’t beat that trio! Your pictures are beautiful! Thank you Cindy! You know if you do want it completely vegetarian you can just use vegetable stock. This is a dish my daughter and husband would enjoy. I need to make this for them very soon! I’m sure your daughter and husband will love it. To tell you the truth Kelly, faro has been around practically forever and I recently “discovered” it. I love cooking with it!! Let me know how your family likes it. I don’t cook with farro often enough. I’m not sure why that is, because it’s delicious! This looks like a lovely dish. A perfect side or dish on its own! Thank you Amanda I’m sure once you start fixing farro it will become a staple. Thank you for stopping and commenting. All right, that settles it, farro finally goes on the shopping list. I’ve never ever made it if you can believe it but this dish convinces me, it looks fresh, healthy and very satisfying. The beach looks wonderful too, so peaceful (despite that nosy (but cute) egret! :)). The pelicans and the egrets would simply love you and your camera 🙂 Let me know what you think of your first taste of farro. Hi Nicole! Thank you so much for coming back and leaving a response and I’m so pleased you like farro. I’m sure you’ll come up with lots of interesting and delicious variations. 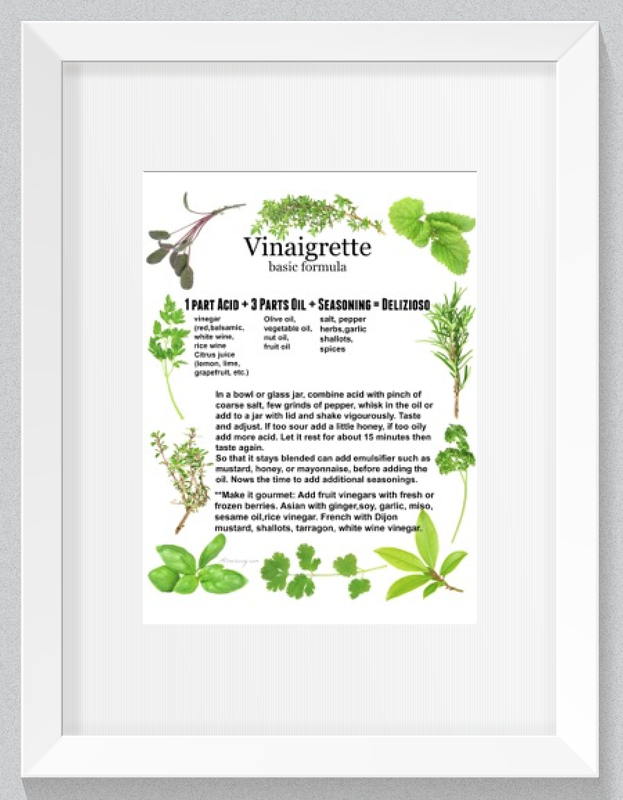 I love the different spices and herbs that you use. Have a great weekend. this looks fantastic!! I have to try farro, looks like the perfect side dish! It certainly is a great side dish Neli! In fact I’ve even used it in an appetizer! Thank you for commenting. 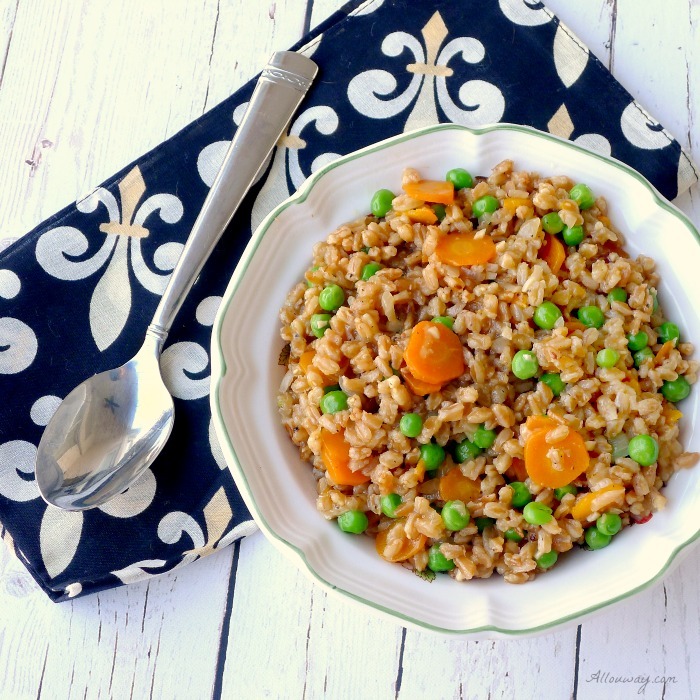 I’m a huge fan farro so this dish would definitely satisfy me! Love the little anecdote about the beach friend you made! Great shot! Thank you Annie. 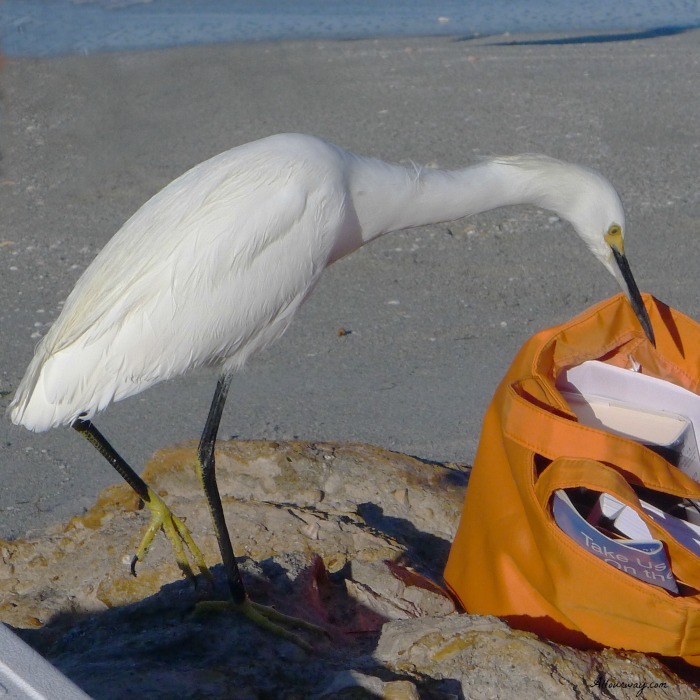 I thought my little egret friend would hop in my bag and let me carry him home. Not shy in the least!! 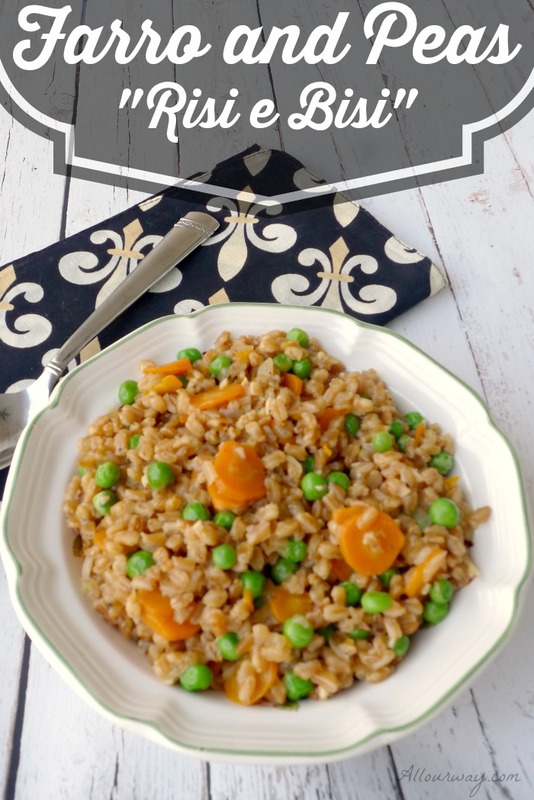 I have to try farro now, it looks so healthy, I can’t believe I have never tried it, this recipe looks so good and totally easy enough for me to make! Hi Sara! I think once you try farro you’ll want to use it all the time. It is so good for you!! I love farro for the chewy nuttiness. It really does add depth of flavor to a dish in place of rice. You are so right Christine. Farro is great! Oh yum! This sounds and looks delicious and hearty! You’re photo is stunning, Marisa! The beautiful napkin really makes the green peas and orange carrots pop! And I love that you added yummy bourbon chicken. What a great combination ?. Sending you great big hugs! Thank you Suzanne — you are so doggone sweet!! That bourbon sauce is super good. Have a great weekend and I’m sending big hugs right back! This sounds like a great combination. I love using farro too, the texture is great and I love the nutty flavour. Love using new grains! I have heard of farro but never used it or bought it! Now I have a good reason to get some farro! Hello Shadi! Once you use farro you’ll want to experiment with lots of recipes. It holds up really well and doesn’t get starchy like rice. Let me know how you like it. Delicious combination. I am always looking for new ways to use this special grain. Now I have another recipe to make. Looks so good. If you like farro you’ll love the recipe, Jovina. It’s easy and very tasty!! Love tasty, easy side dishes, especially, protein and veggies all in one. I’ll be trying this recipe, soon. We also like the picture of the handsome fisherman? Egret reminded me of Phil?